You are here: Virgin Islands News Online » News » New signage or art works on Tortola? Who loves the BVI? Our roving camera could not determine if it’s an advertisement or just someone showing their talent through art. Persons leaving the Ferry Dock in West End on the main island of Tortola are greeted by a 'BVI sign' made in the shape of a heart. Similar signs can be found on utility poles on Cane Garden Bay Hill and Joe’s Hill. 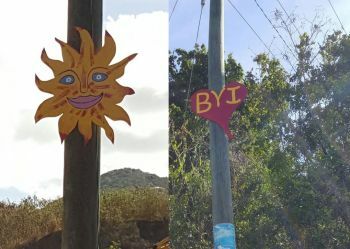 Driving further up from west, going east a few minutes past the police station, is another sign with this time a smiling face resembling the sun attached to a BVI Electricity Corporation (BVIEC) utility pole. 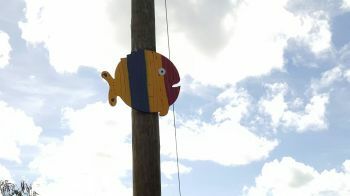 Then after you pass Pockwood Pond you will also see another signage, this time a fish decked out in yellow, blue and red. 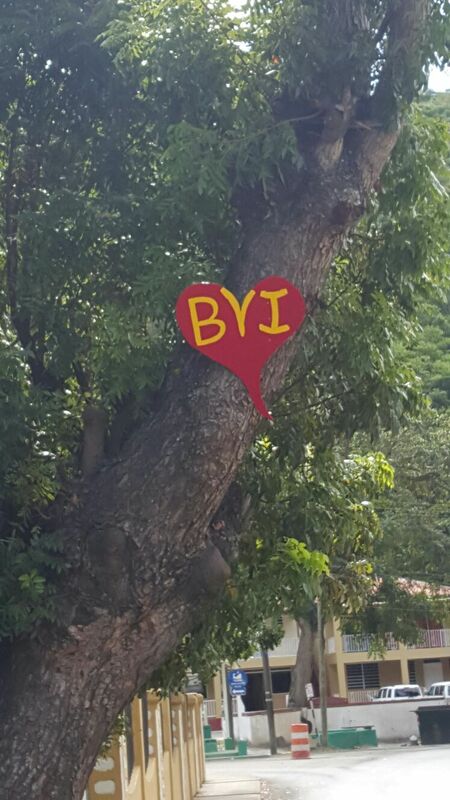 Then once you reach to the Ebenezer Thomas Primary School you are also greeted with another red heart signage with BVI placed in the middle displayed on a tree. It is unknown at this time the person or company responsible for the creative work. In an effort to interview the artist or advertiser, our newsroom placed a call to the Town and Country Planning Department, the state-owned regulator responsible for all public structures, small or big, to see if there was someone who applied to display their works. However, we were told no such application was filed with their agency. We also checked with the BVI Electricity Corporation (BVIEC) to see if they had a name or company for the new signage erected on their utility poles; however, they too had no request made to use their poles for such displays. While we agree that the signage or art work is positive and brings a different perspective to the Coastline scenery, it will be nice if someone comes forward to own their work, especially at a time when the Virgin Islands’ needs love! I too noticed the signs and I thought that the were lovely! Did not notice a thing changed. These are good but there are some that says "AIDS IS STILL IN THE BVI.." and need to be removed! AIDS is in the BVI and it needs to be publicized. Stop hiding!!!!!!!!!!!!! It's called raising awareness. yes aids awareness needs to be raised but not in this manner. The quoting reflects a very negative impact on the territory instead of a positive one. It could have read Aids is real, check your status or something. Very creative there's one right across the High court on the tree it says, "Test before you rest" and I believe there's a picture of a bed and needle on the poster. @ graffiti street - You need a life big time. A very bored person with a very tall ladder. LOL! the printer out worked the system! Some initiative from an artist, nnothing wrong with that at all. I just noticed it going home today, yea you learn something new every day from this news site. on the poles bad idea. 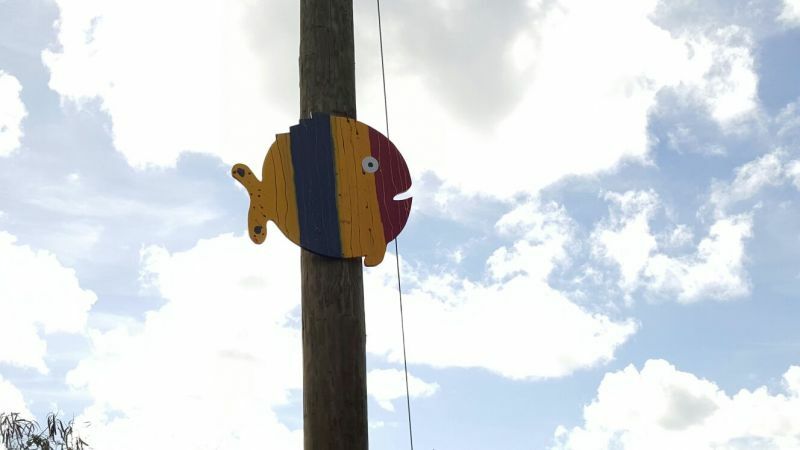 i will knock them off once its on a pole that i have to climb. I truly hope it is as satisfying as u imagine. Thanks, Artists, the signs making the roadside better. We enjoy seeing them. A little girls who passed by the fish at Joe's Hill said, "there is my friend, Mr. Fishy." She was happy, so thank you for the signs. If you need more plywood, just call me at: 1-LOVETHEBVI. The message, it seems, is inspiring and uplifting. The fact that there are people who dislike them, is proof that they deserve to be seen. This art is for all the people who need a hug but are too afraid to be vulnerable. These must have taken someone a long time to make. For those who oppose these, when is the last time you went out of your way to brighten someone else's day? They glow in the dark. Some are beautiful to look at but the cat's eyes glowing in the dark on the pool between dark bushes is a bit scary and Halloween like and when driving at night it can be very distracting.